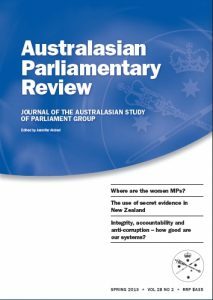 Accountability or Inability: To What Extent does House of Representatives Question Time Deliver Executive Accountability Comparative to other Parliamentary Chambers? Is there Need for Reform? An Optimum Model for the Governance of Parliaments? Executive Accountability to Parliament — Reality or Rhetoric?